In today’s episode of PianoTV, we’ll be building on all the chord information we’ve learned to far, and putting it all together with this episode about How to Read a Lead Sheet. All the chord videos we’ve done – major and minor, 7 chords, diminished chords and suspended chords – can be found by following the links, so if there’s anything you’re a little lost with in this video, you can check those out and get caught up. 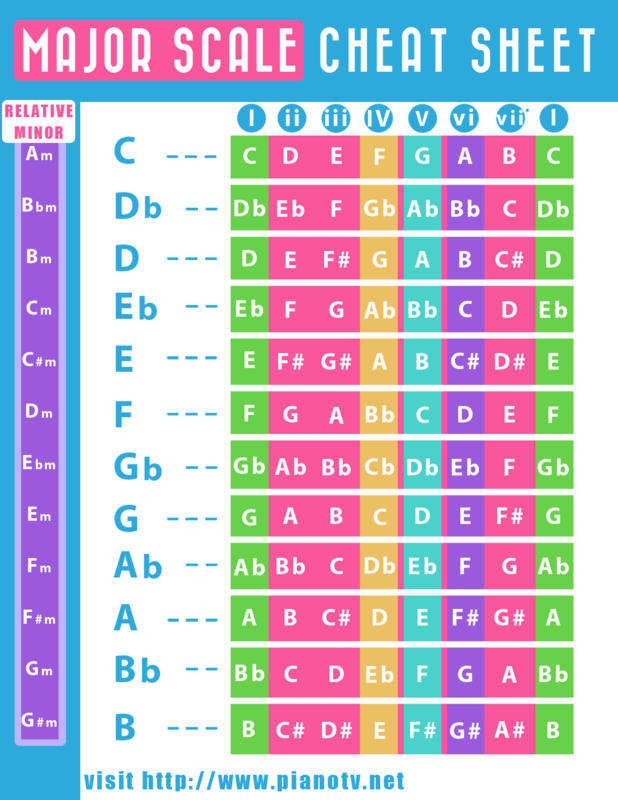 There are a couple sheets that go along with this video – Below there’s a printout of all the major and minor scales, which is helpful when you’re figuring out how to build chords. There’s also sheet music for the piece we’ll be using today as our example, the very famous jazzy piece “You Can’t Take That Away From Me” by George and Ira Gershwin. Oftentimes they’re put in books called “Fake Books” or “Real Books”. Which I realize sounds very confusing, so allow me to elaborate. First of all, fake and real books are a collection of lead sheets, generally jazz standards. A lead sheet is basically the simplest, bare-bones version of a song. So it’ll have a melody, sometimes lyrics, and the chord symbols above – and that’s it. So “Fake books” are called as such because they allowed the performer to “fake it” – a performer could look at a lead sheet and basically make up the song, even if they didn’t know it, and it would sound right. “Real books” are actually the same thing. I think – and correct me if I’m wrong – they’re just called “real books” as a joke – as a spin on the whole “fake book” thing. It could also have something to do with copyright. The best analogy I’ve got for you is this. Most of us had – or have – a grandma, or parents, who have recipes written on little recipe cards stashed away in the kitchen somewhere. Nowadays I tend to rely on the internet for recipes, or sometimes my neglected collection of cookbooks. But a recipe card is very different from an internet recipe. For starters, the internet recipe will usually tell you every single detail, including the ones that aren’t very consequential to the finished taste (like instead saying “flour”, it says “organic, unbleached, 100% Saskatchewan-made flour). The recipe card in your Grandma’s kitchen will just say “flour”, unless for some very specific reason you need to use whole wheat flour, or self-raising flour. Internet recipes are full of pictures and details – many blog posts have dozens of pictures of the same meal. Whereas the humble recipe card has no pictures, and next to no detail. Generally you’ll have all the ingredients listed, and MAYBE get an instruction or two. But that’s it. It’s up to you, the chef, to read between the lines. Do you see where I’m going with this? A regular sheet music book would be like your internet recipe – very detailed, every single note written out for you, and if you follow everything exactly it should come out sounding like the song in question. A lead sheet is like Grandma’s recipe card – all that’s on there is the bare essentials. 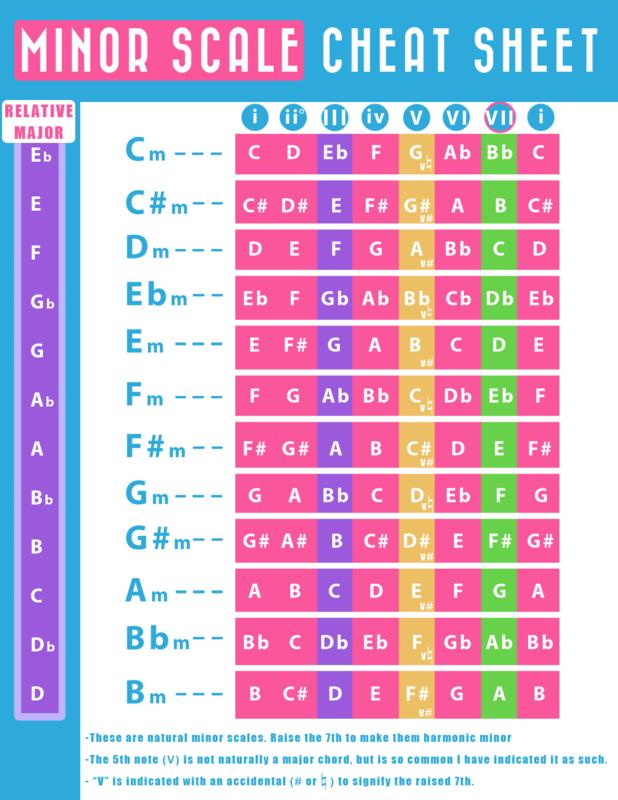 If you haven’t heard the song on the sheet, you might be in trouble – aside from the (usually simplified) melody, none of the rhythm is written out. So if you don’t know if the song is supposed to be fast or slow, upbeat or mellow, it could impact your interpretation of the piece. It’s like if Grandma’s recipe was simply titled, “Cookies”. Well what kind of cookies are they? Chewy or crunchy? Dense or airy? How big are they? How well do they spread in the oven? If you’ve eaten the cookies before, you know exactly what they’re supposed to be like, and a quick conversation with Granny will remind you to slightly underbake them, because that’s the secret to the perfect chocolate chip cookie. (In case you were wondering why I use so many food analogies on this channel, fun fact, I went to culinary school). The thing that’s nice about lead sheets is that, if you know what you’re doing, there’s enough information on that page for you to play an awesome song. You don’t need all the extra details if you know a bit about chord reading and how to improvise rhythms. Instead of reading an 8-page song, you can get by with a simple, no-frills 1-page version of the same song. The song we’ll be using today as our example is Gershwin’s “They Can’t Take That Away From Me”. I picked this one because a lot of people know it, the chords aren’t TOO wild (no 9ths or 13ths or anything), and because it’s fairly slow, which makes it more manageable. The first thing you need to do before trying to play this on the piano, though, is to listen to it! I really like the version with Ella Fitzgerald and Louis Armstrong, and the sheet music is sort of roughly based on this version – it’s in the same key, anyway. I did that so that if you want to play along to the recording, everything should sync up nicely. Because of copyright laws I can’t play you the audio, but I’ll leave the video below for you to check out. I’ll wait. So now to the sheet music! Since we’ve covered chords more in-depth in other videos, we’ll just briefly touch on these. If the chord is just a letter name it’s major (ex: C). If it has a little “m” in front of it, then it’s minor (Cm). The small circle indicates a diminished chord, the sus4 means the chord is suspended (the 4th is played instead of the 3rd), and the 7s should be pretty self-explanatory (C7). A jazz singer would only use the melody as a general guideline – they’d be very comfortable playing with the rhythm and changing the notes as they go. If you’re not going to be singing along, you can use the same strategy on the piano. There’s no need to stubbornly adhere to the rhythm – as long as it still has flow and you’re following the basic rules of rhythm (like keeping everything in 4/4 time), go outside the lines if you’d like! When we’re talking about how to read a lead sheet, there are two ways you can go with this. One, use the piano as pure accompaniment and sing the melody while you play – or, if you’re not into singing, having a friend do the singing while you play. The other way to interpret how to read a lead sheet is to do the melody and harmony ALL on the piano. This will mean doing the melody in the right hand, while the left hand fills in the harmony and bass. Depending on how adept you are, the right hand can fill in some of the harmony, too. If you’re going to sing the melody, you have a lot more freedom on the piano. To keep it simple, you could play the bass notes in the left hand, and fill out the chords in the right. The bass notes are going to be the letter names of the chords. So if it’s a Bb chord, I would play a Bb in the left hand. In the right hand, I can play the full chord. Say we have a 4-note chord like F minor 7. Maybe I’d play an “F” as the left hand bass note, and play the other three notes in the right hand “Ab C Eb”. Don’t feel like you can’t step outside of these notes, either. Sure your chord is “Fm7”, and there are 4 notes in that chord. But you can manipulate it a bit. Maybe you do a quick pass through other keys to add depth and texture. “Comping” is what you call playing the chords more than once to create rhythmic texture. So instead of just pressing the chord once, waiting until the end of the bar, and then pressing the next chord, comping means to add more. This could be as simple or as elaborate as you want, and as your playing level allows. One fun way to practice comping is to throw on a drum beat and try to play along. I’m lucky in that I have an electric piano with drum presets, but drum loops are pretty easy to find online nowadays. If you try to play along with a drum, you should be able to hear if your comping rhythm makes sense. It’s a good way to get your ear working, and to have a mini-jam with yourself. The other way to play this is by getting the right hand to play the melody. Maybe you’re not a singer, maybe you want to have a piano-only show, that’s totally fine. The easiest way to start that is to ONLY play the bass note in the left hand, while figuring out the melody. I like building songs in layers – start from the simplest, most essential pieces (like bass and melody) before filling in the chords and harmonies. So to fill in more chords, relocate your right hand an octave higher if need be, so your left hand has more space. Really low chords tend to not sound very pleasant. This song has a lot of breaks from the melody, which is a perfect opportunity to do little fills and frills. Thanks, and I hope you enjoyed this video on how to read a lead sheet! Have fun playing around with the Gershwin sheet – be creative and go with your muse.